Well another summer has flown by. This summer was actully very busy for me and my family. My kid sister finally got married. What a great wedding. 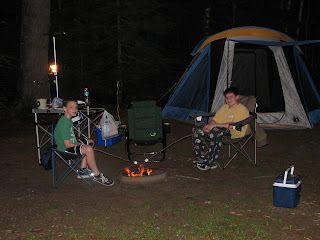 I took my boys camping up in the woods of Maine. We went white water rafting, fishing and saw some Moose. We spent a couple of days with my father. The boys got to ride horses and learn how to care for them as well. I think it was one of our best vacations. Work has been nice and busy which helped to speed the time along. I got a promotion a few weeks ago and I look forward to getting things up and running in the new position just as soon as I can clear a few things from my current plate load. My kids are all doing well. The Olympics were a great inspiration for my boys, who are now both looking forward to the fall/winter swim season. Way to go Michael Phelps! Football has started again and both of my younger boys are both back into the full swing of practices. Autum is pretty much here. The nights are cool and dry and the days are sunny and breezy. I love Autum. I finally finished stacking all of my wood for the season. I do have 2 more cord on order but I have what I need for this seasons heating. I hope it arrives before the snow flies as I'd like to get it stacked and ready for next year. Man the cost for cord wood really shot up as did the demand. I'm trying to get a head start on next year. Thankfully we've done a great job this summer with oil. We'll see what the winter holds. Well, enjoy the last weekend of summer and enjoy the wonderful weather. Unless of course you're on the gulf coast and evacuating from Gustav.